A hire car can be easily found in Bournemouth! VroomVroomVroom compares car hire prices for you from leading car rental brands, including Avis, Budget, Europcar, Sixt and Enteprise. Bournemouth is a seaside town in Dorset, England. It sits proudly on England's southern coast near Plymouth and Southampton. 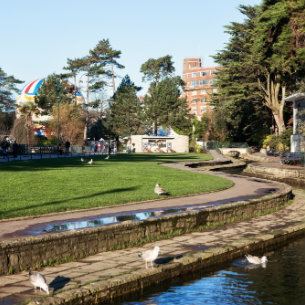 Lewis Tregonwell, a retired army officer founded the first settlement in the area during the 18th century that eventually grew into Bournemouth. The area enjoys a temperate climate throughout the year. It is famous for its abundant flora and fauna, beaches and World Heritage Site. With your buckets and spades at the ready, you'll have seven miles of award-winning beaches to build your sand castles! Why rent a car in Bournemouth with VroomVroomVroom? With Bournemouth being so close to Poole and of course Portland Bill, renting a car in Bournemouth through VroomVroomVroom is the best way to experience it all. How better to reach those special destinations than in a cheap car rental? We compare rates on a single page from major rental car agencies, thus making it easier for you to find the best car rental from your travel. In addition, our rates are often cheaper than other direct rental car companies. Our site is very easy to use. Plus there are no booking and modification fees. We have our friendly customer care experts ready to assist you. Contact us today either via phone call, email or live chat. Hop into a hire car and zip your way along Bournemouth's coast to find the best spot! Lazily sitting beneath a magnificent cliff line, this bay enjoys its own micro-climate with some of the warmest sea temperatures in the UK coupled with stunning views of the Isle of Wight and the Purbecks. The coastal area of Bournemouth and Poole offers over 25 different watersports, more than anywhere else in Europe. They are very easy to access driving a hire car. With so many attractions and natural wonders to take your breath away in Dorset itself, you can't chance missing out on any - especially when you have such a fantastic hire car at your disposal. So check out the local news and listings to find the real gems to visit! This Grade II listed Victorian park is located near the town's pier along the banks of the small river Bourne. It is divided into three separate stretches (Lower Gardens, Central Gardens and the area near the pier) with abundant rare flora and fauna worthy of exploring. The most popular area is the Lower Gardens because of its year-round attractions including mini golf, art exhibition, aviary and street food stalls. The perfect spot to go biking is at the Central and Upper Gardens since there is a cycle path that runs through Bourne Valley Greenway. Located in East Cliff, Bournemouth's popular art gallery and museum was founded by Merton Russell-Cotes and was opened to public during the early part of 19th century. The museum is open for all types of group sizes and is wheelchair friendly. The Russell-Cotes house also features four art galleries and a tropical garden which is known for its Victorian stone grotto and fountain. This massive venue has always boasted the highest reputation of being a premier conference, leisure and hospitality hotspot in England. The Bournemouth International Centre is the perfect place to hold various concerts, meetings and exhibitions as well as opera, ballet and comedy performances. BIC also has a Terrace Coffee shop where guests can enjoy great views of the Pier Approach while sipping on a cup of coffee. 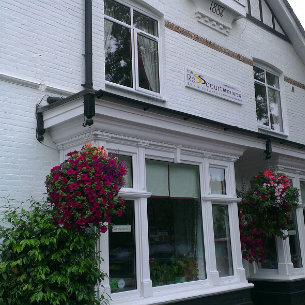 The Rosscourt, Bournemouth, is a small 8-bedroomed bed and breakfast, exclusively for adults, a child free zone, ensuring you have a peaceful and relaxing stay. Situated in a quieter area than the main town, you can still have easy access to shops, restaurants and the beach. Leave your car rental, on the on-site car park and explore the area by foot. Bedrooms are spacious, comfortable and airy with seating areas and en-suite shower rooms plus free WiFi to keep you connected. All rooms are available for single occupancy at a reduced rate, ideal for single travellers on business or for leisure. Avis Bournemouth - 33-39 Southcote Rd, Bournemouth, . Budget Bd Budget Bournemouth - 33-39 Southcote Road, Bournemouth, . Budget Budget Bournemouthvan - 33-39 Southcote Road, Bournemouth, . Europcar Bournemouth City - Upper Station Approach, Holdenhurst Road, Bournemouth, . Hertz Bournemouth Apt - Christchurch, Bournemouth, . Hertz Poole Ferry Terminal - Christchurch - Dorset, Poole, . Sixt Bournemouth - 1112 Christchurch Road, Bournemouth, .